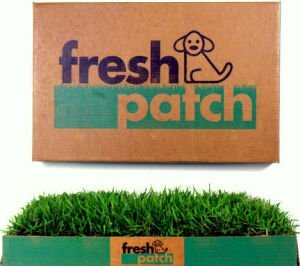 FRESH PATCH is a stylish R-E-A-L GRASS potty box that is fully disposable. The special hydroponically-grown grass is light-weight, long-lasting, and dirt-free. The complex root structure absorbs urine and odors. The wonderful grass scent naturally attracts dogs--unlike plastic potties and diaper-like pee pads that smell bad, turn dogs off, and are disgusting too. With no reusable parts to clean or replace, disposal is EASY. This dog-friendly, people-friendly, Eco-friendly potty can be used anywhere, any time. Ideal for apartment dwelling, busy schedules, and avoidance of early-day, late-night, or bad-weather dog-walks. Now, your dog can get relief when needed, not on a pre-set schedule. Our 16"x24" potty is nice-and-roomy for dogs up to 25 lbs. and easy to discard. Other potties are too bulky and heavy for most dog owners to manage. For larger dogs, FRESH PATCH units can be joined together. For more information and training tips, check out freshpatch.com! Fresh Patch ships on Mondays and Thursdays. We ship from CA via FedEx, and transit time can take 2-5 days, depending on destination. Holidays will affect shipping times, and uncontrollable weather or shipping conditions can occasionally cause some delays. For potty emergencies, contact us at 1-888-814-2670 (free) or at freshpatch.com, and we'll do our best to accommodate you! We pride ourselves on customer service, and we will strive to give you timely delivery and assist you in any other way we can. If you have any questions about this product by Fresh Patch, contact us by completing and submitting the form below. If you are looking for a specif part number, please include it with your message. Berucci Pet Potty Three Layer Dog Toilet Training Pad Park Patch Mat Indoor Outdoor Large Size 30" x 20"
PoochPads Indoor Turf Replacement Grass Dog Potty, Large/28" x 36"